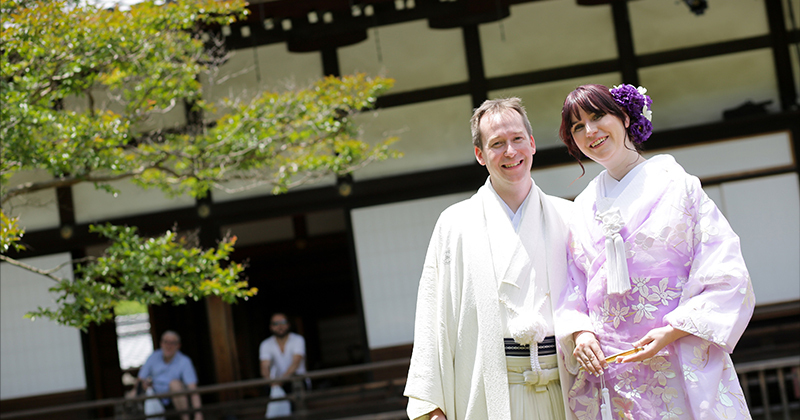 Kris and Desirie are from the US and love Japan a lot. The two of them could speak a little Japanese, so they decided to have a Buddhist wedding ceremony at Koudaiji Temple. Desirie’s favorite color is purple, so she chose a purple organdy colored bridal kimono for the ceremony. The bouquet and head-piece also used purple flowers. Kris wore the white montsuki kimono; he looked so cool!!! They invited their Japanese friends to join them. They had two rehearsals before the day of the ceremony, so when the ceremony was carried out, everything went smoothly. Kris, Desirie and all their friends had a really enjoyable time during this special wedding ceremony. Congratulations on your marriage, and we wish you all the best from the bottom of our hearts.